The Early Christian Monuments of Ravenna are a unique collection of mosaics and monuments from the 5th and 6th centuries. Ravenna, an important port, was known under the Romans and Byzantines as Classis. It developed into a major centre of Christian art and culture on the instigation of Galla Placidia, the wife of Western Roman Emperor Constantius III (and regent of that empire herself for a few years). She was a fervant Christian and was involved in the building and restoration of various churches throughout her period of influence. Ravenna is a fairly large city, and the monuments that contain the mosaics are spread out over several locations. One is even in another town, in Classe. I had some trouble orientating myself at first, though there are signposts to the churches. And I had to take care where I was walking, because Ravenna appeared to be a town of cyclists, passing the pedestrians on all sides. First I arrived at the Basilica of San Vitale. Here I paid the entrance fee of 8.5 EUR that is valid for 5 of the major monuments. What to say about the Basilica? It is an octagonal building, somewhere between Roman and Byzantine in style. Its interior has to be seen to be believed: there are mosaics everywhere, on the floor, at the walls, at the ceiling. Lots of gold, and clear Christian symbols. At the back of the Basilica lies the Mausoleum of Galla Placidia. This is a tiny building. Access is limited to 5 minutes, so I had to wait with a couple of others for our time slot. Certainly worth waiting for - the mosaics here seem a little older and less refined. But what a brilliant blue mosaic that covers the hallway! Another cluster of these monuments is located about 15 minutes away by foot. Next to the giant Duomo lies the Neonian Baptistery. As small as the Mausoleum, but worthy in its own right. The floor and baptismal font (a former Roman bath) are made of marble and have lots of ornaments. The mosaics here cover part of the walls and the ceiling, completing the very fine overall interior. The Archiepiscopal Chapel is closed at the moment, and I didn't have time to go to the Basilica in Classe. However, the mosaics and monuments I have seen I can recommend to anyone. (i) S Giovanni Evangelista is one of the oldes churches in Ravenna founded by Galla Placidia close to the port. 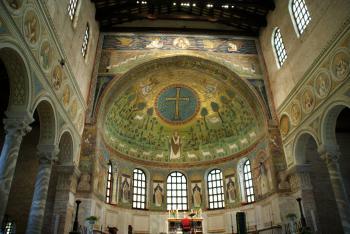 It partly retains classical shape of Ravenna`s basilica: 3 naves with classical columns, apsida and atrium. Nowadays shape is the result of after-war reconstructions due to the bombing because of a fatal location close to the railway station. The original apsida was round inside and polygonal outside (typical for all Ravenna basilicas) and was decorated by vast mosaics that do not exist anymore. Inside the church, there is a small display of floor mosaics survived from midle ages - and one can see the huge difference and drop from late antique to medieval. (ii) S Croce complex is also one of the oldest churches in town but now partly destroyed and changed. What is now called as Mausoleum of Galla Placidia (but it would be better to call it martyrium with mosaic of martyr S Lawrence inside) was originally part of this church (now, they are separated by fence). It had shape of multiple latin crosses. The nearby church of S Maria Maggiore was built a bit later, and there are indications that its apsida was originaly separate central building - most likely real mausoleum. (iii) The large ancient burial complex were located a bit far from S Vitale close to basilica of S Francesco (there are original antique mosaics in the crypt flooded by water - switch-on the light by tossing a 1 EUR coin inside....) and Tomba di Dante. (iv) Basilica Ursiana was predecesor of baroque cathedral of Ravenna. The cathedral is not very applealing now, but original basilica was decorated by huge mosaics (fractions such as blessing virgin Mary are displayed in the museum). Neonian babtistery and S Andrea chapel were original parts of this episcopal complex. Only archeology would answer the questions what parts of original basilica are buried under baroque shell of today`s cathedral. (v) Spirito Santo church (just opposite to Arian Babtistry) is former Arian cathedral and has typical shape of basilica of Ravenna (three naves, wooden ceiling of main nave, antique columns, and absida round inside but polygonal outside). (vi) S Michele in Africisco is still partly preseved as a small church close to Piazza del Popolo and it is part of a private shop now. The original mosaics were moved to Bode Museum in Berlin (I have not seen it yet)), and several decorative carvings I have seen in Ravenna in National Museum. (vii) Exarchs Palace / Palace of Teodoric of still unknown origin and function is located very close to S Apolinaire Nuovo along Via di Roma (originaly Via Cesarea founded outside antient city walls in marshlands). The Palace is depicted as PALATIUM on the mosaic in nearby S Apollinaire Nuovo. (viii) Domus dei Tapetti di Pietra with very fine late antique floor mosaics (mosaics of 4 seasons and of Good Shepard). It is close to S Vitale and worth-visiting. If you arrive in Ravenna by car you will face the usual problem of where to park during your visit. Now, I am congenitally incapable of willingly paying for parking - indeed we toured Italian WHS for 17 days and only spent 2.60 euros on it! Even if others are not so “penny pinching” it may be of use to know that there is a large, well paved area of free, long term parking in front of the Mausoleum of Theodoric. You are going to want to visit there anyway and the car park is only a 15 minute walk from the San Vitale complex and the city centre. Another logistical aspect about Ravenna’s WHS which it is worth understanding is the ticketing system – this is complex even by Italian standards. There are 8 inscribed locations – 5 of these (Archiepiscopal Museum with the Chapel of Sant’Andrea and the Ivory Throne, Neonian Baptistery, Basilica of Sant’Apollinare Nuovo, Basilica of San Vitale and the Mausoleum of Galla Placidia) are in Ravenna centre and require a combined entry ticket (you cannot buy an individual ticket for any of them), 1 (Arian Baptistry) is also in the centre and is free to enter and 2 (Mausoleum of Theodoric on the city outskirts and Basilica of Sant’Apollinare 6kms away in Classe) require a different combined entry ticket. That combined ticket also includes the (non-UNESCO) National Museum at San Vitale and these 3 sites are also available for entry by individual tickets at each (at a slight extra cost over the combined ticket if you want to visit all 3 but cheaper if you only want to enter 1 or 2 of the WHS locations). I won’t go into the opening hours as they too are complex, with each having slightly different opening/closing times and are best studied on up-to-date web sites BUT, most importantly, all except the National Museum are open on a Monday! We decided that we didn’t need to enter the Theodoric Mausoleum (It is well visible from beyond the fenced in area and is worth seeing if only for its 300 tonne single roof stone) and not to see the National Museum. So we bought a ticket just for Classe and then one for the 5 in the city. 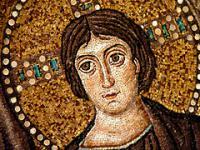 If you do decide to “complete the UNESCO set” with a visit to Sant’Apollinare at Classe I would recommend going before you get “mosaiced out” in Ravenna itself!. 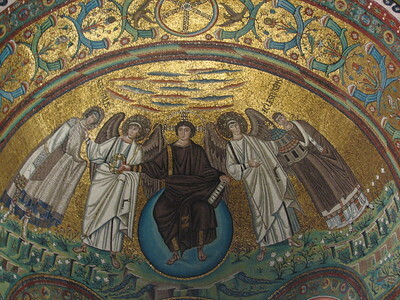 The Mosaic in the apse is particularly striking and “famous”. The site also has good free parking and doesn’t suffer from the tourist crowds and noisy guides as in central Ravenna – indeed visiting the Galla Placidia mausoleum was a bit of a “bun fight” even on a mid September afternoon, with its own separate queue and a 5 minute time limit with lots of “pushing” among the tour groups when inside. The site overall is undoubtedly justified as one of our “Top 200”. At all the locations the mosaics are wonderfully “fresh” and so different from the later Christian iconography on display at most Italian religious sites. It is interesting to use the site as a starter for exploring the “Arian Controversy” and trying to identify the “Arian” aspects and the possible numerous “firsts” among extant early Christian art – the beardless, naked Christ (photo), the first mention of the names of the 3 Magi, the depiction of Satan counting goats and lacking later acquisitions such as horns etc etc. In my opinion, Ravenna is one of the finest and most interesting WH sites not just in Italy, but in all of Europe. The remains from the late Roman/early Byzantine Empire and the early Christian era are incredibly well-preserved and the mosaics for which Ravenna is so famous are just stunning in every way. The WH listing consists of 8 distinct sites that can be easily visited on a walk through the city (except for Classe). From the station, I first went to the Arian Baptistry (a small building with a nice ceiling mosaic), then to the Basilica of Sant' Apollinare Nuovo (a large complex with 2 fantastic rows of mosaics plus some hard-to-spot hands showing Theoderic and his court that were not quite removed when the Byzantines reconquered Ravenna). After a detour to Dante's Tomb and the Basilica of San Francesco with its famous groundwater-covered mosaic floor, I went to the Neonian or Orthodox Baptistry (larger and much more decorated than the Arian one, with exceptionally beautiful mosaics) and then to the Cathedral Museum, which houses the Archiepiscopal Chapel and the only remaining oratory from the early Christian era. Then I continued to the San Vitale complex, which includes the Basilica boasting Ravenna's most famous mosaics which show Emperor Justinian and his (in)famous wife Theodora, who, despite never having set foot in the city, still wanted to project their power in their remaining Italian lands. The complex also features the Mausoleum of Galla Placidia, which contains the city's oldest and best-preserved mosaics (a fantastic blue), as well as her sarcophagus (she is buried in St.Peter's in Rome, though). A short walk from the centre, the Mausoleum of Theoderic stands in a pretty park and is the only remaining tomb from a Germanic king (his sarcophagus is of course empty). The final monument, the Basilica of Sant' Apollinare in Classe, stands in the former naval port of Classe, a 5-minute train ride from the city. It has a similar design and construction to its namesake church in the centre (both named after Ravenna's first bishop), maybe with less impressive mosaics. All in all, a highlight of any trip to Italy. I visited this WHS in September 2012. It is truly a hidden gem! The terracotta monuments are a treasure chest of mosaics, one more beautiful than the other. I visited all 8 listed sites and my favourite is the Cappella S. Andrea (Arcivescovile), a small private chapel with fine mosaics (the highlight is the gold/blue sky with 99 species of birds). The least aweinspiring of the sites was perhaps the Mausoleo of Teodorico which is quite a walk out of the historical city centre. The Basilica in Classe is also worth visiting. I reckon Ravenna is one of my favourite WHS in Italy. The Ravenna WHS consists of eight early Christian monuments of the 5th and 6th Century: basilicas, baptisteries and mausoleums. Probably the significance of the monuments alone would justify the inscription, because little is preserved from the period between the Roman Empire and the Christian Middle Ages. But the exceptional feature of the site are the marvellous mosaics. We started our tour, like probably the most visitors, at the Basilica of San Vitale. San Vitale is an octagonal building and has mosaic decorations on the walls and the ceiling. The exceptionally well preserved mosaics depict scenes from the Old Testament and portraits of the Emperor Justinian and his wife Theodora accompanied by their entourage. The mosaics glow in gorgeous colours: blue, green and gold. It is hardly possible to describe how impressive they are and photos can not adequately illustrate their magnificence. You have to see them. Close to the Basilica San Vitale is the Mausoleum of Galla Placidia. Mosaics cover the entire surface of the vault, the central dome and large parts of the walls. The ceiling shows a deep blue sky with white and golden stars. The theme is the Redemption, Jesus is shown as the Good Shepherd with his sheep, and the apostles are depicted. Next we went to the Neonian Baptistery near the Cathedral. It is dominated by the large octagonal baptismal font made ​​of marble. 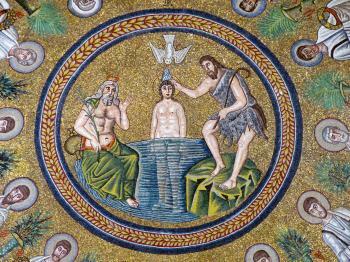 The mosaic at the ceiling depicts the baptism of Jesus in the Jordan by John the Baptist. Also the walls are decorated with mosaics and marble inlays. Next to the Cathedral is the Archiepiscopal Chapel (accessible via the museum), the only preserved private oratory of the orthodox bishops. Another highlight is Sant'Apollinare Nuovo, a basilica with three naves and with Corinthian columns. The side walls are decorated with mosaics, on the left the procession of 22 virgins led by the Three Wise Men and on the right the procession of 26 martyrs. Noteworthy are the mosaics at the entrance showing the palace of Theodoric and the ancient harbour of Classe. After the conquest of Ravenna by Byzantine forces, the mosaics of Theodoric and his courtiers were removed and replaced by images of curtains. If you look closely you can see remains of the original figures like e.g. hands. The apse is from the Baroque period and does not harmonise with the rest of the church. On the way back to San Vitale is the small Arian Baptistry, the ceiling mosaic is preserved and shows the baptism of Jesus. These six monuments are located within walking distance in the centre of Ravenna and are covered by a combined ticket for 9.50 Euro (in 2011). The Mausoleum of Theodoric is located in a small park just off the centre, you have to cross the railway line and a main road. It is not decorated with mosaics and you do not miss anything if you do not visit. A particular highlight is the Basilica Sant'Apollinare in Classe, about 8 kilometres south of Ravenna. It's architecture is similar to the homonymous basilica in Ravenna, but the interior of the basilica has impressed me even more. The apse mosaic depicts the Transfiguration of Jesus, the first where Jesus is symbolized by a cross (photo). The lower part shows a green landscape with sheep and the Holy Apollinaris of Ravenna. If you have enough time, the detour to Classe is worthwhile. It is really impossible to say which monument and mosaic is the most impressive. All of them are exceptionally well preserved, it's hard to believe that they are so old. Half a day is enough to visit all the monuments, the city of Ravenna itself has not much to offer compared to other cities in northern Italy. This is truely a city of stunning mosaics, and all but one of the 8 sites listed in this WHS is decorated with the most colourful of mosaic art. By contrast the Mausoleum of Theodoric has a few faded frescoes and a red stone hip bath. Why was this included in the WHS? 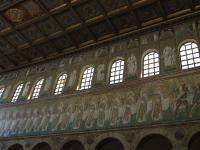 The two churches of St Appolina, one in Ravenna, the other in Classe were for me the most outstanding. I travelled between the two by bus #4 and by train. In 2011, to visit all 8 sites cost E19.50. Ravenna does not only have the most impressive mosaics that I've ever seen, but the town itself is also a really pleasant surprise. It is a very lovely town full of pintoresque corners and it is well worth a visit. If you are on your way to or from Venice, don't miss it!! Wow! There's no other word to describe the reaction when you enter the Basilica di San Vitale for the first time. 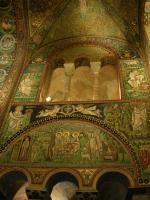 The shimmering gold and the brilliant greens of the mosaics are just jaw-droppingly beautiful. Do you remember all those pictures from your art history or European history text books? Here they are. Justinian, Theodora, and the last vestiges of the glories of the Western empire are on display here. Due to Ravenna's having served as the capital of the empire for a short period after the sacking of Rome, there exist numerous other impressive monuments from the 5th and 6th centuries AD, such as Mausoleo di Galla Placidia, Sant'Apollinaire Nuovo, and the Neonian Baptistery. All are easily visited in an afternoon, and all are covered by a joint ticket costing 9.50 euros (as of May 2005). Emperor Justininian: The Church of San Vitale, dating from 548, was built under the sponsorship of Justinian I and his wife Theodora who both are memorialized in mosaics on the North and South walls of the apse. How "personal" this sponsorship was is disputed and indeed a construction of this name had been commenced prior to Ravenna's capture from the Ostrogoths by Justinian's general Belisarius in 540 (after which Ravenna was made the seat of Byzantine government in Italy). The design does appear however to have been completely revamped and it has been suggested that it reflects that "of the Byzantine Imperial Palace Audience Chamber, of which nothing at all survives". Built in the 5th century: Earliest monuments date from the 5th century, including the "Mausoleum of Galla Placidia, built in the second quarter of the 5th century"
239 Community Members have visited.